Two weeks ago, the London-based FOLD Gallery opened a new show by the extraordinary English artist Simon Callery named ‘Flat Paintings’. With the new series the artist is suggesting that one of the defining characteristics of painting is now one of many characteristics in contemporary painting. Callery’s works combined in the exhibition bear all the markings of their creation. Reevaluating the conventions of painting, the British artist who originally trained as a sculptor has recently worked alongside the University of Oxford’s archaeological excavations in Moel y Gaer, Bodfari, North Wales where the landscape informed the surface areas of the large-scale works on show here. Canvases have been saturated in intense pigments, which have then been crafted, torn and stitched onto stretchers. 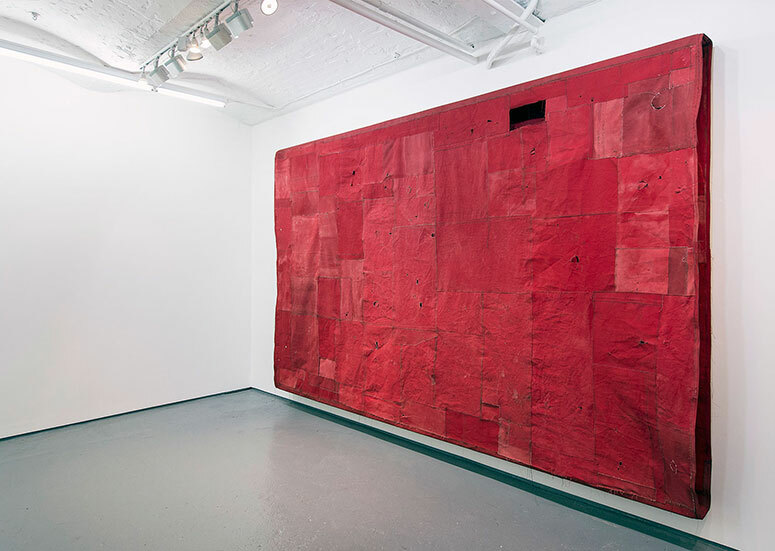 Our favorite work is the large-scale work called ‘Flat Painting Bodfari 14/15 Cadmium Red Deep’: a mysterious patchwork in a tremendous shade of red, inevitably sucking in any gaze that is placed upon it. Simon Callery is an English painter and draughtsman. He originally trained as a sculptor, graduating from Cardiff College of Art in 1983, but from 1985 devoted himself to painting. In 1987 he returned to London. His paintings at this time originated as views across the urban landscape, yet through a prolonged process of abstraction resulted in a far more ambiguous image. His later work remained formally consistent but became increasingly refined in conception and execution. Large canvases in a muted palette, registering subtle changes and with direct reference to source imagery kept obscure, typified his production of the 1990s. Frank about the romantic intentions governing his work, Callery made paintings that demand contemplation: detailed variation in surface area is as important as the overall composition. His paintings are often densely worked, but with the paint thinly applied; the surface consists of numerous finely made vertical and horizontal lines of paint, charcoal and chalk. In 1991 Callery organised his first one-person exhibition in a converted warehouse. His work was soon being shown alongside that of other Young British Artists although his work could be seen as more traditional than that of many artists of his generation. Although painting remained at the centre of his art, in 1997, in collaboration with photographer Alan Watson, Callery explored similar themes in a large-scale photographic piece documenting in detail the surface of an archaeological dig supervised jointly by the Oxford University Museum of Natural History and the Pitt Rivers Museum. The incredible ‘Flat Paintings’ exhibition will run at the FOLD Gallery, located at 158 New Cavendish St. in London until the 14th of November.